This is the amusing moment a pet turtle engages in a standoff with a dog which was trying to steal its treats at a back garden in California. 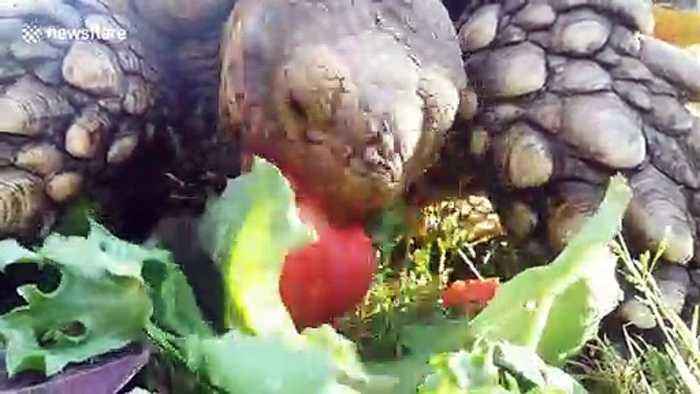 Footage captured on April 12 shows the turtle, called Herbie, munching with pleasure on a pair of fresh strawberries when its friend dog, PoohBear, appears to sniff the fruits. Afraid that PoohBear is going to eat the strawberries, Herbie confronts PoohBear in a tense standoff until the dog loses interest and runs away.